This cozy creekside cabin is the perfect place to stop and refresh on a trip to Girdwood. Situated on a quiet road and conveniently located, this wood filled space offers privacy, comfort and proximity to nature. Take a soak in the hot tub or relax in the sunny main room with well appointed kitchen. Master bedroom has a queen bed and deck access, second bedroom has two twin beds, sleeper sofa in living room. Well-appointed kitchen, great shower, comfy beds. Heated entry added Fall 2018, pictures will be updated soon! House is bordered by a creek and publicly owned forest on a quiet residential street. A short walk or drive to Alyeska Resort, Girdwood Brewing, and the restaurants and shops of Girdwood. Hi, we're Malcolm and Haley! We are long-time Alaska residents who love getting outside trail running, boating, hiking, backpacking and skiing. Our Girdwood cabin is a private retreat to enjoy after a day of playing outside. With nearly a decade of experience in Alaskan tourism, we are also happy to help with ANY part of your trip planning. We hope you have a wonderful trip to Girdwood and a cozy, comfortable time in our home! We're sorry to say the wood stove is not for guest use due to insurance policy. Simple and comfortable cabin for spending game time and sharing food with family and friends. Cabin had everything we needed including puzzles and games. Although there is no oven, we made do with lots of stove top cooking with the well stocked pots, pans, knives, and utensils. My girlfriends really enjoyed our weekend at the cabin. We took in a hike to Byron Glacier, a jaunt just up the road to Virgin Falls, and mountain biking and hiking around Girdwood. It was great to be able to prepare our own food or grab a bite in town. Relaxing in the hot tub was a perfect ending to days of activity. We appreciated that not only were there various teas and coffee available, but also shower supplies and blow dryer WITH diffuser! Thanks for sharing your cabin with us! This cozy cabin has everything you need to enjoy a winter vacation in Girdwood. It's extremely well appointed, easy to find, and within a 5 minute drive to the Alyeska ski resort. 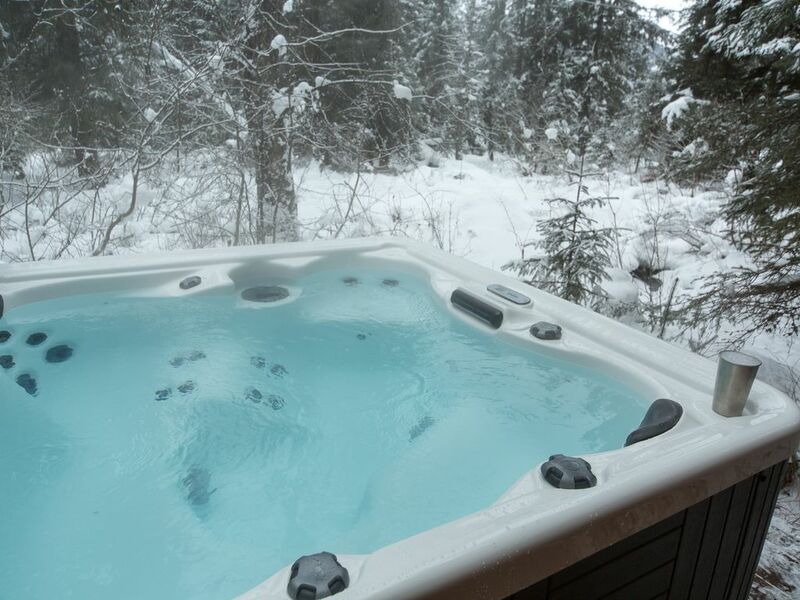 The hot tub was much appreciated after a long day of skiing. I would not hesitate to recommend this rental. We thoroughly enjoyed our stay at the cabin. I’ve stayed at many rental homes in the past and this was one of the best supplied I’ve stayed at – all of the basic supplies were available, and the unexpected extras were an added bonus (excellent knives and pans!). The owners have gone out of their way to make sure that everything you could possibly need is available at the cabin. The hot tub melted away the aches from mountain biking, and overall the cabin was very comfortable for our family of four. We also really enjoyed the town of Girdwood and the Alyeska ski resort area. Comfortable, conveniently located, and super clean! We live on the peninsula & booked this cabin to spend a couple days in the Girdwood/ Whittier area with family visiting us from the East coast,. We had 3 adults and 3 children and the cabin accommodated all of us very comfortably. It is in a great location, close to the townsite and the mountain, and easy to get to from the main highway. The cabin is immaculate- kudos to the cleaning service- and decorated in a cute way. The hot tub is in great shape and there are a lot of little extras- like robes for the hot tub, really good coffee beans and a grinder, etc. It's quiet and private and the creek running out back by the hot tub is serene. My east coast family was thrilled with the charm! Definitely recommend this if you are looking for a base out of Girdwood!